Vintage looking, pine and soft wood crate. These are the perfect stage prop for your Bugsy Malone production. Besides a great prop, it also makes a handy place to store your guns on stage. These Splurge Inc. wooden crates measure 85cm long, 50 cm deep and 35cm high. We have lots of crate in stock however, if you would like more than one crate with your order, please email your query as this impacts on the transport cost. These branded, authentic looking, pine and soft wood crates will be a great addition to your Bugsy Malone stage props. 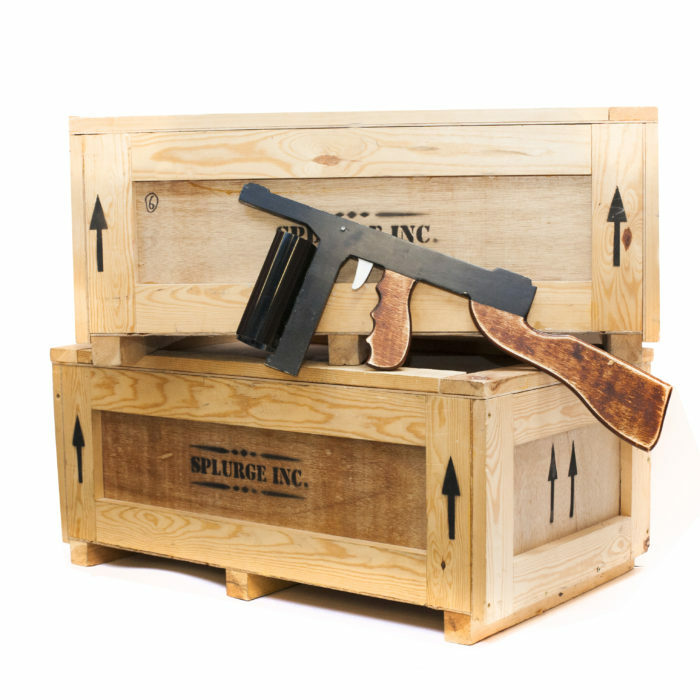 Our Splurge Guns fit perfectly into these wooden crates and it looks great when they’re grabbed out of one on stage. The splurge wooden crate also makes a great background stage prop and really adds to that Fat Sam, Speakeasy 1920’s feel. There are two sizes of wooden crate available on our website. This is the larger of the two. The large wooden crates can hold up to twelve splurge guns and the small wooden crates can hold five splurge guns. There is a one off £100 deposit on all Bugsy Malone prop hires. This will be refunded once your hire items have been returned to us. Please see our terms & conditions for more information.